Introducing the PastorServe Series from David C Cook, a line of resources developed to stem the tide of pastoral burnout and crisis. In Survive or Thrive Jimmy Dodd reveals that the majority of pastors are not known—by anyone. They purposely isolate themselves from both staff and congregations so their insecurities, doubts, and failures aren’t exposed. Yet confiding in the wrong person can be a dead-end at best and disastrous at worst. Former pastor Jimmy Dodd reveals how those in pastoral ministry can receive ongoing support, accountability, and restoration from a boss, counselor, trainer, mentor, coach, and good friend. 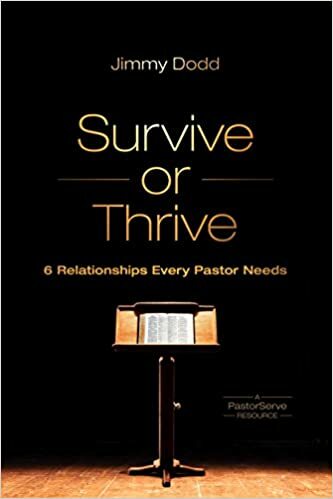 Discover how you can move from surviving to thriving with the six relationships every pastor needs. Jimmy Dodd is the founder and president of PastorServe, a ministry that provides care, counseling, and friendship to pastors. His passion is to see pastors thrive. A pastor himself for more than thirty years, Jimmy is now a well-known speaker and is a graduate of Wheaton College and Gordon-Conwell Seminary. Jimmy and his wife, Sally, have five children.